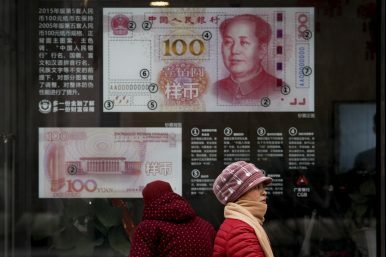 Women walk by a bank window panel displaying the security markers on the latest 100 yuan notes in Beijing, Feb. 18, 2019..
Market reform has been China’s flagship economic initiative for over 40 years, yet each new round of reform often ends up with more heavy-handed state control. Why does China’s market reform so often backslide? Why is government intervention a persistent syndrome even after the center repeatedly promised to “give the market a decisive role in resource allocation”? With the state playing a central role in coordinating economic activities, the Chinese government builds and sustains the market, but falls short on empowering it. While building functional markets requires state facilitation, China’s state-led market reform hinders the establishment of healthy market selection and adjustment mechanisms. Business performance is dependent more on “riding the policy wave” than prudent management or innovative business models. Subdued by political objectives, the alleged market economy “with Chinese characteristics” encounters various challenges both in terms of the macroeconomy and sector-specific reforms. The policy shift in mid-2018 from market reform to growth stabilization belies a recurrent pattern of a policy-induced business cycle, which the leading liberal economist Wu Jinglian described as the “seesaw economy.” Growth has been created by massive state-led investments, leaving an indebted, risk-filled economy, but contractionary side effects from deleveraging motivate a return to economic expansion. Starting in late 2017, the state embarked on supply-side structural reform to make China’s growth model more “normal” and sustainable by giving the market a greater role in resource allocation. The rationale behind this move, according to Huang Yiping, a professor of economics at Peking University National School of Development, is that China’s economic success is based on an open goods market and controlled production factors (labor, land, capital, etc.). To rebalance the economy, adds Huang, the state must tolerate slower growth, improve income distribution, upgrade industry structure, and gradually free up production factors. Yet the reform campaign did not pan out. Ironically, the market restructuring effort was executed with one-size-fits-all administrative measures due to political pressure on officials at various levels. The central government distributed production capacity and debt reduction targets to provinces, which were then vertically allocated to cities and counties. Directives, restrictions, and quotas, rather than market-led rebalancing, are preferred by local officials to achieve political key performance indicators. This leads to policy overimplementation. Coupled with trade conflicts with the United States, China’s exports and domestic investment stalled and the state decided to stage a new expansionary cycle in mid-2018. Keynesian-style government investment became the most effective “painkiller” for economic slowdown since 2008, and this time is no different. Politically motivated local governments and state-owned enterprises (SOEs) launched infrastructure projects with cheap credit from state-owned banks. Politburo economic meetings in four consecutive quarters in 2018 saw mounting concerns over the economic slowdown and rising support for expansion. The March 2019 session of the National People’s Congress approved a 0.2 percentage point raise in the fiscal deficit, reaching 2.8 percent. The local special-purpose revenue bond quota saw an 800 billion renminbi ($119 billion) increase. Active fiscal policies will support infrastructure construction in transportation, logistics, next-generation internet, and urban facilities. The most worrisome aspect of infrastructure expansion is local government solvency, despite the state’s reassurance that investment will be “targeted and mild.” Previous rounds of stimulus already strained local coffers; while disclosed government balance sheets look healthy, the state is vague about implicit debt figures, which are believed to be much larger than explicit liabilities. Disciplining illicit local borrowing made progress in 2018; officials are held accountable for increasing unpermitted debt. But it remains in question whether the approved fiscal enhancement is sufficient for local infrastructure expansion, and if not, how localities should balance between growth targets and borrowing restrictions. Meanwhile, lowering the GDP growth target to 6.0-6.5 percent does not mean the goal is easier to achieve; it is now much costlier to generate growth as investment needed for one additional unit of GDP has grown from 3.5 in 2007 to 6.3 in 2016, according to Huang Yiping. As such, local malpractice may still occur to ensure targets are hit. Vested interests and rent-seeking lead to inconsistent and often times contradictory state management of sector-specific reforms through the dual-track system. As China took a gradualist approach in the transition from planned to market economy, it set up a new track for marketization in parallel with the planned track, hoping that the two will eventually merge together. However, balancing the market and planned tracks is tricky. Interest groups representing monopolistic state-owned sectors can balk at the reform agenda. Illicit practices in new markets normally abound before rules could be established. Arbitrage between the two tracks often benefits actors with privileged access to political resources. In promoting market reform, the state often faces a similar dilemma as for the macroeconomy — should it choose stability or reform? After a market is established and operational, the state pulls out of the market only to find a surge of malpractices that destabilize market orders. When the state weighs back in, market actors lose their vitality and start speculating on policy loopholes or acquiring subsidies. Market selection and price signals are largely ineffective. This pattern is widespread across various industries undergoing the dual-track transition, including electricity, healthcare, and more. China’s healthcare marketization, for example, is marked by both market and state failures. Since the start of reform in 1985, public hospitals became de facto for-profit market entities as they were encouraged to take responsibility for their own financial sustainability. The dual-track system generated incentives to provide care services by allowing hospitals to monopolize drug sales at 15 percent markups, and compensating practitioners for over-prescription of drugs and lucrative testing. In addition to distorting financial incentives, the policy introduced managerial inefficiencies that inflate costs and retard quality improvement. With misaligned market signals, these “drug-addicted” hospitals are blamed for pushing up healthcare costs, harming public health, and driving local health insurance funds to the brink. State-led efforts to restore market mechanisms have been disappointing. In the 1990s, a 30 percent cap on prescription drug revenue as a ratio of total income was introduced as a way to curb excessive drug spending for patients. After initial pilots, the policy was rolled out nationwide and recognized as the primary indicator for hospital performance in 2009. This, too, failed to yield satisfactory results as profit-seeking public hospitals gamed the system to increase non-prescription income by dodging high-quality drug prescriptions, duplicating tests and examinations, or opting for complicated surgeries. The drug sales cap failed to shake up the strong pro-markup lobbying group of public hospitals and pharmaceutical companies. A second wave of state intervention began in 2015 after several unsuccessful attempts to separate drug sales from monopolistic interests. In 2017, the “two-invoice” system superseded markups in the pharmaceutical procurement supply chain to restrict public hospital funding sources to medical services and state subsidies only. In January 2019, the State Council proposed new performance criteria to evaluate third-tier public hospitals, which replaced drug sale caps with requirements on “rational” prescribing and dosage. Nevertheless, incentives are still misaligned with the public good. Making up funding losses will be hard for hospitals, especially those lower-level ones that rely even more on drug sales. Patients may see surging service charges for fewer drug prescriptions. The goal to ensure fairness, profitability, and effectiveness in public care providers is hardly achieved, not to mention cleaning up the bloated, ineffective, and opaque pharmaceutical supply chain. The root cause of unempowered markets in China is the unlevel playing field between state and private actors. This makes competition policy a potential breakthrough for market reform. There are three defense lines against market failures, according to Wei Jianing of the State Council Development Research Center: corporate ethics and self-restraint, market punishment to drive out unethical firms, and government intervention. The first two channels are ineffective in China because of education failures, the lack of a social credit system, and an uneven playing field. Being the last-resort action, however, state intervention should not replace the market; it should eliminate obstacles to a functional market system and foster fair competition environment, argues Wei. Discontent over an unfair competition environment instigated public criticism over private businesses’ financing difficulties in mid-2018, when the early signals of the slowdown began to manifest. Financial repression and credit rationing make access to cheap credit a valuable resource in itself, most of which flows to local governments and state-owned enterprises. Private firms without political connections are unable to get bank loans, not to mention borrowing at a cheap interest rate. The disadvantage was painfully felt as growth prospects stalled. Policymakers from People’s Bank of China governor Yi Gang to President Xi Jinping came out to reassure the market and pledged upcoming support. This was then achieved through frequent policy directives that urge banks to extend more credit to private small firms. Again, market principles were not at work. Even with the political mobilization to save the private economy, the delivery of such support is easier said than done; there are concerns that expanded bank credit may either balloon the real estate bubble or add to banks’ non-performing loans. The safest bet for banks is to lend to private firms operating in areas in line with national strategies. Top-down bureaucratic structure, too, can be an obstacle to market reform. People’s Bank of China (PBoC) Research Bureau director Xu Zhong pointed out that bureau chiefs charged with steering the drafting process lack authority to resolve conflicting agency interests. Consequently, final documents skirt around contentious issues and fail to address tough issues or practical challenges. Besides problematic policy formulation, local officials are often more responsive to superior directives than resolving long-term trouble. A strong central preference for either reform or business-as-usual leads to local overimplementation one way or the other, but centrism baffles local officials. This poses a great challenge for effective policy transmission. In his Great Transformation, Karl Polanyi explained how markets are not completely free and self-regulated systems. However, the root cause for unempowered markets in China is overuse of state power, which obstructs reform agendas as the market mechanism remained underdeveloped. The long-term solution of thorough institutional reform is far from the horizon, given the persistent vicious cycle of failed market regulatory autonomy and ensuing government intervention. Zhizhen Lu is a China macroeconomy analyst at a Beijing-based strategic advisory firm. He graduated from the Elliott School of International Affairs with a MA in International Trade and Investment Policy. Meiying Xu is a China analyst at a Beijing-based strategic advisory firm. She graduated with an MA from the Paul H. Nitze School of Advanced International Studies (SAIS) at Johns Hopkins University. Can China keep up its growth and deliver on its "harmony" pact with the Chinese people?